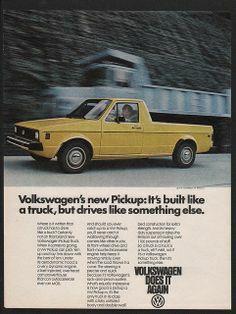 That the VW Pickup was designed specifically for the US, despite it being a tiny FWD unibody thing, may seem rather odd from today’s perspective, given how big trucks have become, and trying to sell anyhting less than a full-framed truck seems to be the kiss of death. And it’s not like this pickup was designed in a rush after the second energy crisis, when everyone was rushing to micro-size their cars. No, the VW pickup arrived in 1979, by which time the first energy crisis was becoming a distant memory. No wonder it never sold very well. But it did develop a cult following, most of all in diesel form. After the second energy crisis, diesel anythings were in huge demand. And here was a pickup that could get 40+mpg. And in subsequent decades, there were certain folks who were steadfast in their loyalty to them. If they had a second car, it was most likely a Prius. I’ve seen this one around for years, but it’s finally getting sold. No price, but I bet it won’t dirt cheap. Even though the cult of the original VW diesels has thinned out, there will be some idealistic kid who will buy it, most likely. It’s not like they’re hard to keep running. The bed is a full 6′ long, which affords sleeping quarters for a cozy couple. And its load capacity rating was a not-inconsiderable 1,100 lbs (500kg). This bed looks to be in very decent shape, thanks to the topper, which looks to be as old as the truck. No info on how many hundreds of thousands of miles this one has put behind it, but from the looks of the drivers’ seat, I’d guess at least a couple. Driving these is akin to driving a very vintage air-cooled VW: it’s slow, but it will get you there. That’s the reality of some 45 horsepower. 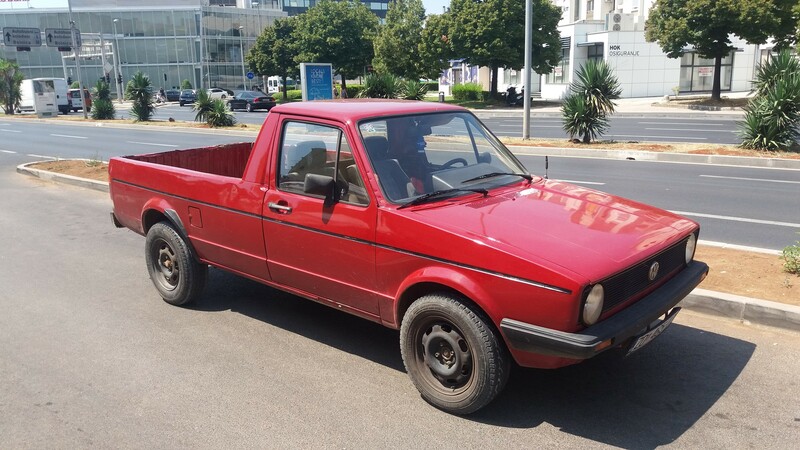 No, it’s not a “Rabbit Pickup” as Wikipedia refers to it. The Rabbit name was never used. Of course it came to be known as the “Caddy” after VW started building it in Sarajevo, Yugoslavia. It was also built in South Africa and Argentina, but never in Germany, and was a very rare sight in its motherland. And it kept on being built right through 1995. I’ll miss seeing this one, but all things must pass…into the hands of a new loving owner. Delayed CC Effect: I spotted this one in traffic coming home from work a couple three weeks ago…. 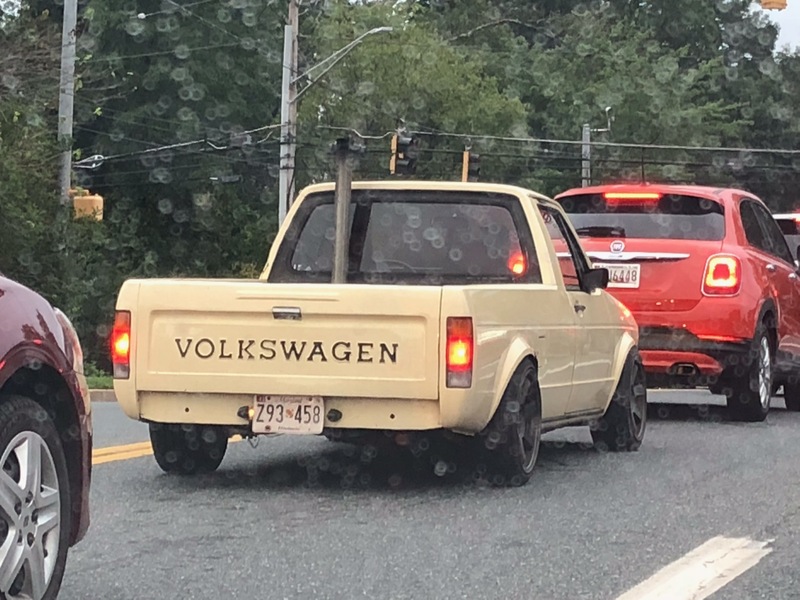 looks like this kid is intending on “Rolling Coal” with his…. 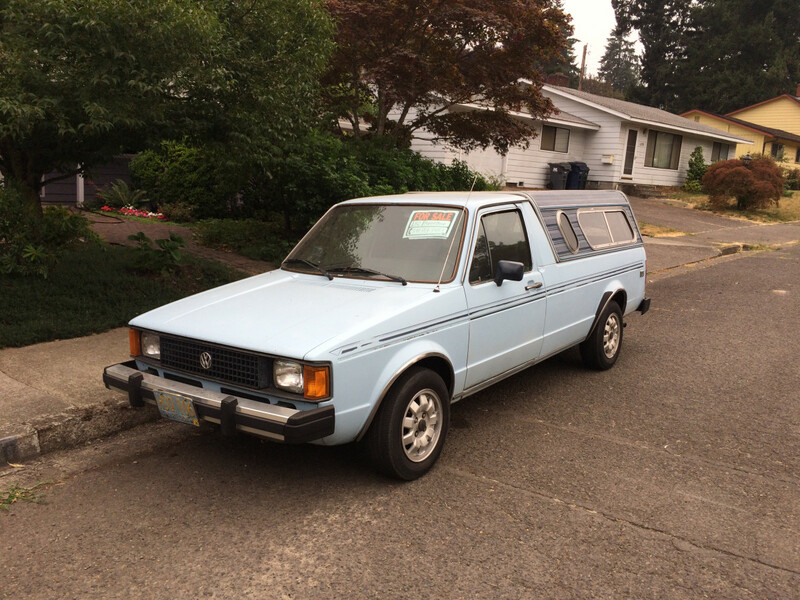 My first, and longest personal experience with a VW Diesel, a Rabbit though not a pickup, involved Eugene back in 1980 or so. A friend and I drove from the San Francisco Bay Area to visit a friend going to school in Eugene, I. His newly acquired Rabbit Diesel. I drove about half the distance, my first long stint behind the wheel of a low-powered vehicle on a freeway, in the mountains, with heavy truck traffic which was sometimes faster on the uphills, but slower as I pegged it at 80+ on the downhills. It was a high concentration effort to maximize speed and still be safe and courteous. But the best part was when I noticed that the fuel level just wasn’t dropping. My friend seemed unconcerned that the gauge might not be functioning right, and by Roseburg, 450 miles into the drive, I’m calculating that we must be getting at least 60-70 mpg. At full throttle. I’m ready to buy one of these rolling roadblocks. Finally, my friend casually revealed that he had installed an extra gas tank in the spare tire well. We were doing more like 45 mpg … still good, but not enough for me to defect from my much faster 35 mpg Fiesta. You get used to not buying fuel often with diesels, I have to top up the road user tax more often than the tank on my Citroen, RUC is sold by the thousand kms the tank lasts further than that commuting. I heard these were pulled from the market because people overloaded them and then would crash them. This was because they were FWD and could not turn properly when the weight bias changed to the rear and the front end was light. I’ve never heard that, at least not in the US, where they were discontinued when the Golf Mk2 appeared. From today’s perspective these are insanely slow, but then again almost everything was when this vehicle was new, so it was a somewhat level playing field. I seem to recall the Rabbit of the same era taking over 20 seconds to get to 60 mph. I’d imagine the top speed was not much higher, maybe 70 to 75 mph. And at the time the Rabbit diesel was introduced in 1977, I’m not sure that a contemporary Mercedes 240D was much quicker. In fact, it may have been worse. By way of comparison, I’ve read that the last diesel Golfs sold in the US reached 60 in under eight seconds. Amazing what a turbo and years of fuel delivery and engine management technologies can do. 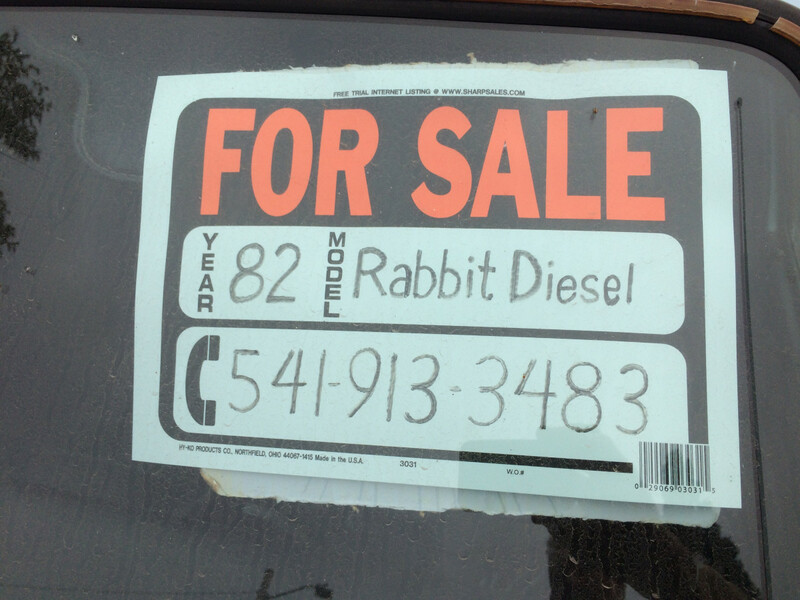 My sister and BIL owned an 81-ish Rabbit Diesel. I recall riding with them one cold, windy night. With a really stiff headwind my BIL had difficulty getting past 50 mph on the highway. OTOH, it was the only one of their several VW diesels that could regularly crack 50 mpg. Tradeoffs. I work for an auto auction service in central MN. We will occasionally get one thru even now. It looks to me that the people who bought these critters drove them til they died. ( The people, not the cars ) The surviving kin don’t know what the hell to do with it and let them go to auction. It´s true that they were not often seen here in Volkswagenland. But the Caddy as it´s called here has it´s loyal fans here, too. A company in my hometown, which is in the street cleaning business, still uses it today. Though I once had a thing for VWs, and am still fond of pickups, the closest I’ve personally come to one of these was a 1990 Golf, hecho en Mexico, gas engine, that I had many years ago. It was good on fuel, handled well, but became idiosyncratic in its later years, and, though I liked it, got rid of it when I grew tired of chasing gremlins. My wife had an old Rabbit, from when they were made in Pennsylvania, when we met. It was pretty beat by then, and the word visceral comes to mind when I think of the feeling of riding in it. Though crude in temperament and not much to look at, she, and both of her brothers before her, put a lot of miles on that thing. She replaced it with a decently equipped Accord, and never looked back. 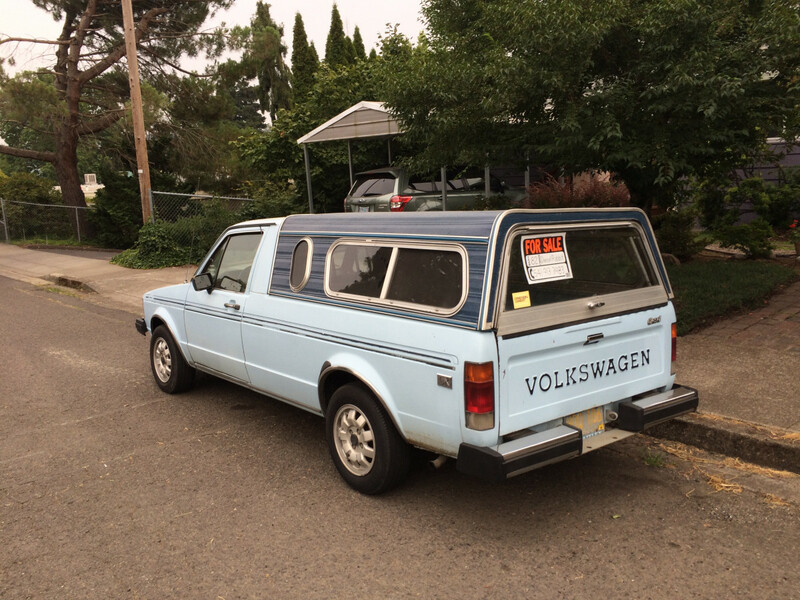 Some people near where I live have several VWs, of this vintage, including at least one pickup, parked in their yard, with one, perhaps the one that runs, in the driveway. A few years ago I bought some truck parts from a guy who had a yard full of diesel-powered VWs, including some of these. Like the folks mentioned above, most of them seemed to be parts vehicles, and there was one runner in the driveway, a scruffy-looking Rabbit or Golf. He made his own fuel from spent vegetable oil, and had a mini chemical factory in his garage, with all manner of plastic drums and a lingering scent of French fries. He claimed that he drove a lot, had a good source for oil, and the capacity to make enough fuel to be self-sufficient. It seemed ideologically important to him beyond finances, for it must have required quite a bit of time and effort to make all that fuel and keep a vehicle that age on the road as a regular driver. He didn’t seem to want to chat, so I kept my questions to myself, got my parts and left. I still wonder what he did with the glycerol that is a waste product of biodiesel manufacture, and how he kept his fuel from gelling in the winter. Perhaps he had a cosmetics business on the side. For years, my brother was a motor route driver for the Lima News (Lima, OH). 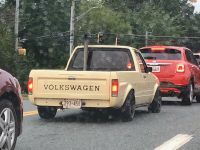 He bought a VW pickup to use for that purpose. I don’t remember how long he kept it, but I DO remember it kept blowing head gaskets. And I think at one time, it needed another cylinder head, too. I’ve heard it is not difficult to swap a more modern turbo 4 VW diesel into these old VW diesels. If that was true it wouldn’t be a terrible option for someone who simply loved these old pickups. There was a house here in Gallup that had a pale yellow VW Caddy and a pale yellow 70s Lincoln Continental both sitting there. It was quite the contrast! Yes, you can bolt in a 1.9l TDi motor type 1Z, as my 1996 Passat has in it. 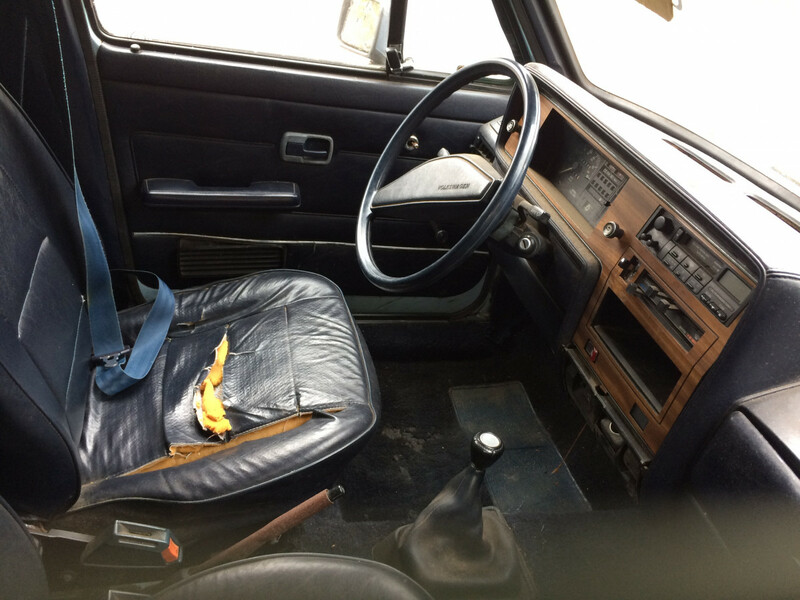 You could also bolt in a 1.9l turbo-diesel (early 1990s) sans electronic controls from a Canadian car. Both swaps were pretty popular. 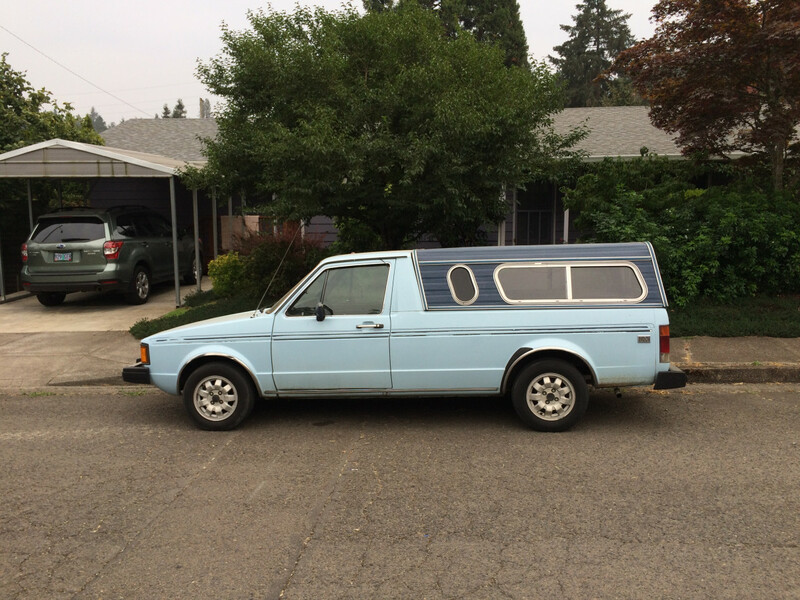 I bought a bunch of Passat body parts from a guy north of Seattle that took the 1Z engine out of it and put it into his crew-cab-caddie – he took a 4-door Rabbit and mated the front of it with the back of a VW pickup, making it a much more functional (and powerful) vehicle. 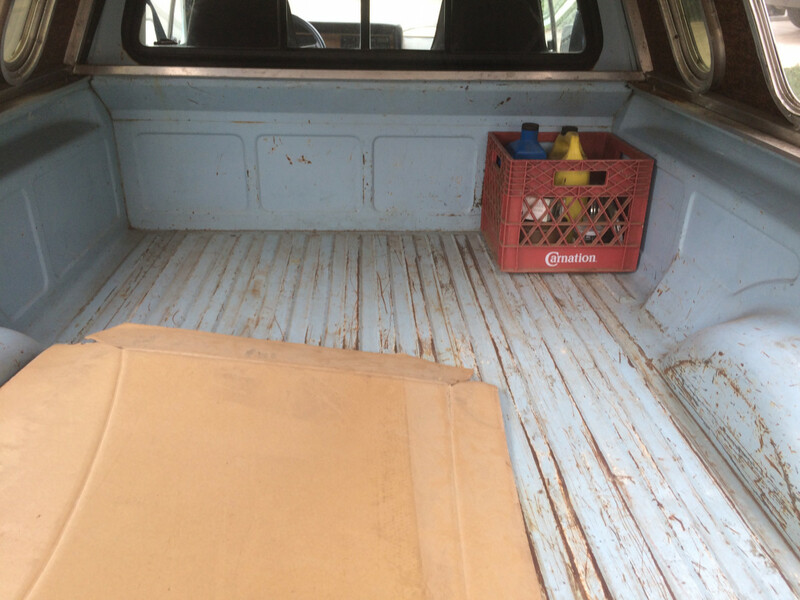 The cab space in the pickup is extremely limited. Though it is true that the first energy crisis of 1973 was likely a distant memory in 1979, is when the 2nd energy crisis started (hostage crisis, etc..). I’m not sure how long the design gestation took for this, but the timing should have been very good if small trucks were to be popular…and Ford, Chevrolet, and Dodge did all have other small RWD trucks available at this time…and soon Dodge also released the “sporty FWD” Rampage which like the VW was FWD…it seems that small trucks were pretty common at this time…maybe because the manufacturers were by this time expecting energy shortages to become more common and to give other options. I think maybe that they were FWD rather than RWD might have something to do with it, though some may argue that small trucks might not carry the weight of cargo that larger ones might, these were the only FWD trucks in the US, and haven’t been seen since. Though mini-vans eventually all became FWD, they were nominally developed first to carry passengers which hopefully would weigh less than the cargo they could contain (though of course people do use mini-vans to move cargo). Anyhow, they were gone after 1984…maybe more to do with the easing of the gas crisis by then? Anyway, if the idea of an FWD pickup was to be a good one, due to better fuel economy, then introducing one in 1979 I think would have been favorable (rather than questionable) timing….but only VW and Dodge would know for sure why they were discontinued after 1984. I think by 1985 the 2nd gas crisis had become a memory, and larger cars were popular again. Maybe if it had persisted we’d have seen more FWD pickups (or at least RWD pickups that had good fuel economy)….nowdays seems the opposite…you can buy a large pickup but finding a small pickup (outside of Nissan and Toyota) is unusual. Diesel…of course at this time that was the only option if you weren’t satisfied with fuel economy of gasoline engines, there were no viable electric options (Citicar maybe excepted, but it was hardly a general purpose vehicle). So, in 1979 if I was concerned about getting fuel, but also needed to transport some cargo (maybe bulky but light) this would have been what I bought. Also remembering in the movie “The China Syndrome”, which also came out in 1979 (right before Three Mile Island), Jane Fonda drove a Diesel VW Golf, which seems to fit for someone back then who might be concerned with energy shortages. I really enjoyed the 8 years and 289,000 miles of my VW Pickup. 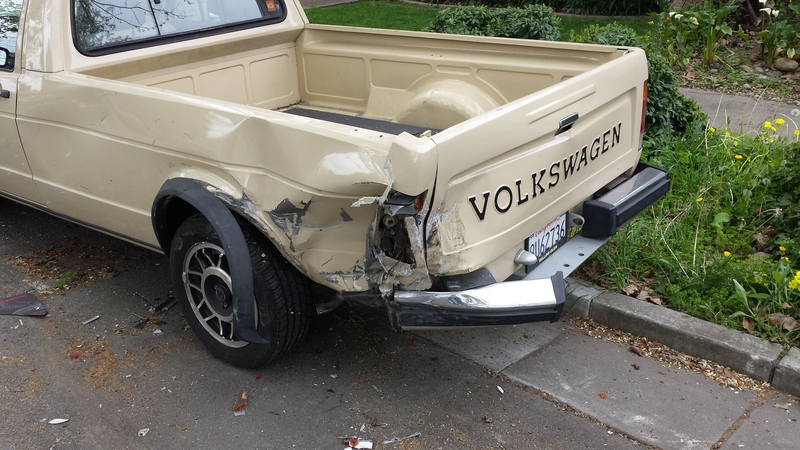 She was running strong and reliably up until a texting driver plowed into her.